Seaforce Charters has a long history operating along the whole length of the Ningaloo Coast. Our 50ft Westcoaster “Valiant” is Coral Bays most proven fishing vessel. We specialise in deep sea bottom fishing, light and heavey game fishing and deep dropping. Full and half day charters depart Coral Bay most of the year, but we are also available in Exmouth for the Blue Marlin season (October to March) and all the way from Gnaraloo to Exmouth for Exclusive charters all year. Equipped with top of the range tackle and equipment, we have everthing covered. Being a owner operator, you can be sure your skipper Adam Cottrell will allways work hard to put ypu on the fish and maintain one of WA’s best catch rates. What to bring: Bring any lunch or snack you require as no food is provided on the charter. Normal meeting point is out the front of the “Reef Cafe” next to Bayview caravan park reception at 7:00am for bus pickup. Please ring when you arrive in Coral Bay to confirm pickup time. All bookings and charters are subject to weather conditions. What is included: We provide all the fishing gear, bait, water, cordial, tea, coffee, hot chocolate and a ice chilled esker for any food or other drinks you would like to bring along. Keep what you catch (state bag limits apply), fish filleted and bagged by crew for you at end of day. 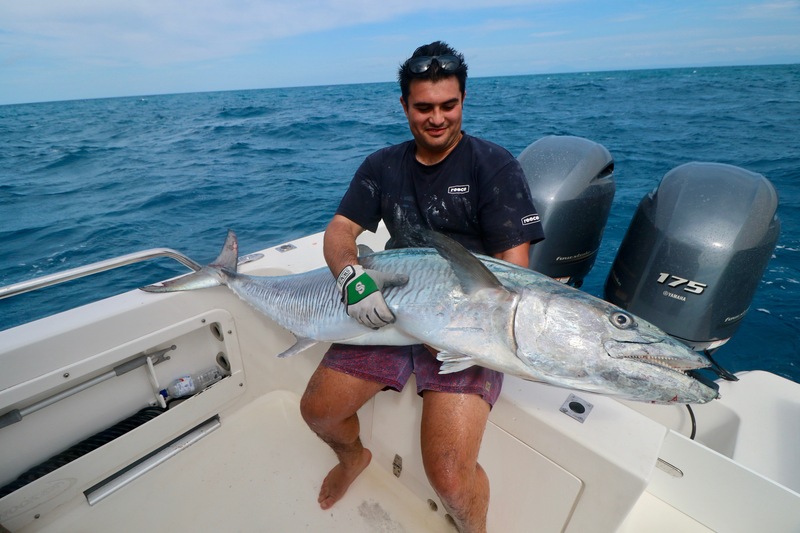 Our guided sportfishing charters depart from Innisfail, Cairns or Port Douglas daily. We offer a range of 5 full day charters to choose from a mix of general sportfishing techniques through to individual stylised charters focusing on one particular sport fishing technique. We also offer extended charters to the outer reefs consisting of 3, 4 or 5 day trips. All our charters are booked on a private boat basis and cater for a maximum of 3 anglers. Transfers to and from your accommodation are provided with each charter, as well morning tea, lunch and afternoon snacks. Soft drinks and fresh water are on ice for you refreshment throughout the day. All rods, reels and lures are supplied on you replace it if lost or broken basis. Giant Trevally (GTs), Spanish Mackerel, Coral Trout, Red Bass, Black Marlin, Dogtooth Tuna, Yellowfin Tuna and Maori Wrasse to name just a few. What to bring: Hat, sunglasses and sunscreen a towel is always handy. We pick you up from your accommodation and drop you back at the end of the day. What is included: Morning tea, lunch and afternoon snacks. All rods and reels and lures. Transfers to and from your accommodation. A bloody good day on the water. We are fishing fanatics that have spent two decades developing the ultimate fishing experience in Costa Rica! Our captains have decades of experiencing catching the great Game fish off Costa Rica’s Pacific coast.Striped, White, Black Marlin, Sailfish, Dorado, Yellowfin, Amberjack, Roosterfish and more! What is included: Water, Fishing Gear and Tackle, Snorkelling Gear, Life Jacket, First Aid Kit, Bait.